The story begins in 1987, when the Government commissioned a study to examine the feasibility of a 5th terrestrial television channel in the UK. The investigation was carried out by the Department for Trade and Industry, The Independent Broadcasting Authority (IBA) and the BBC. The main arguments put forward by the study in favour of a fifth TV channel were to give viewers more choice at no extra cost and to increase competition amongst commercial TV broadcasters and reduce the cost of advertising. Studies established that coverage of 65-70% of the population could be provided on Ultra High Frequency (UHF) in the band using channels 35 and 37. Both channels were in use at the time for non-broadcasting purposes, but these users would be moved to other frequencies. It was also pointed out that in some areas it may be necessary to retune video recorders and other domestic equipment to avoid interference from the Channel 5 signal. In 1990 The Broadcasting Act was passed which stated in Section 28, that The Independent Television Commission was required to establish a fifth terrestrial TV channel and Section 29 stated that they must award the licence through competitive tender. The commission had to be satisfied that the applicants passed a programme quality threshold, The programmes to be included in the service must be of high quality and appeal to a wide variety of tastes and interests. It was also required that in addition, all applicants must submit a cash bid and business plan. Section 30 of the act also stated that retuning of equipment must take place at the expense of the licensee. The invitation to apply for the Channel 5 licence was issued by the ITC on 14th April 1992. Only one application was received, from 'Channel Five Holdings Ltd' on 7th July 1992. In December 1992 the bid by Channel 5 Holdings Ltd was rejected after the ITC expressed doubts over the business plan and level of investor commitment. In July 1993 the ITC published a consultation document incorporating the results of of an ITC technical review. More than 70 responses had been received by October, including declarations of interest from parties who may be interested in applying, should the licence for Channel 5 be readvertised. The ITC decided in February 1994 that there was a strong case for the readvertising of the licence, all that was needed was confirmation from the Government that the original frequencies were still available. The Secretary of State for National Heritage, announced on 14th July, the Governments decision that one of the two original frequencies, Channel 35, would not be available for the purpose of broadcasting a 5th terrestrial channel. The ITC expressed concern over the matter, but still managed to clear transmitter sites to gain a possibly more than 60% coverage for the Channel 5 signal. The decision to readvertise the Channel 5 licence was announced on 15th September 1994, with the invitation to apply issued on 1st November 1994. The closing date for applying was set as 2nd May 1995. Applicants had to show they had a detailed plan with the resources to back it, to show that they had the capability to retune all domestic equipment which would suffer interference from the Channel 5 signal. The ITC stated that a minimum starting area with full coverage (66% of the population) was to be achieved as quickly as possible and no later than year 5 of the 10 year licence. The ITC set a minimum amount of time for each of the mandatory programme categories which the licence would be expected to satisfy, with an increased minimum in the sixth year. The first part of the tender was set by the ITC at zero. On 2nd May 1995, the ITC received four applications for the Channel 5 licence. The bids came from New Century TV Ltd (British Sky Broadcasting, Goldman Sachs, Granada Group, Hoare Govett, Kinnevik, Polygram, Really Useful Group and TCI International) who bid £2,000,000; Virgin TV Ltd with a b id of £22,002,000; UKTV (CanWest Global Communications Corp., Scandinavian Broadcast System SA, SelectTV Plc, The Ten Group Ltd) who bid £36,261,158 and Channel 5 Broadcasting Ltd (MAI (later named United News and Media Plc), CLT/UFA, Pearson Plc, Warburg Pincus & Co) with a bid of £22,002,000. The ITC sought and received undertakings in relation to the two identical bids from Virgin Television Ltd and Channel 5 Broadcasting Ltd. Comments from the ITC's Viewer Consultive Councils (VCCs) and viewers, who were invited to comment by the ITC leaflet 'New Channel 5 licence - your chance to comment', were taken into account by the Commission. Channel 5 Broadcasting Ltd and New Century Television both passed the quality threshold requirement in relation to programming. UKTV and Virgin TV both did not meet the requirement for different reasons. It was announced on 27th October 1995 that the bid with the highest cash bid of the two that met the threshold, Channel 5 Broadcasting Ltd was to be granted the licence. Virgin TV however, appealed against the ITC's decision and on 22nd November 1995 the High Court granted leave for a judicial review of the decision. On 26th January 1996 the judgment was issued. The review found that there was no indication of illegality or unfairness in the ITC's award of the licence and no evidence that Channel 5 Broadcasting had been treated preferentially. On 18th April 1996 the ITC confirmed the granting of the licence to Channel 5 Broadcasting Ltd. The licence agreement stated that 50% of programming must be original productions and commissions and there are also requirements for the number of hours of religion, children's, news and current affairs. David Elstein, after recent experience at BSkyB became the chief executive in August 1996, Dawn Airey from Channel 4 became director of programmes, Michael Atwell became controller of features and arts, Tim Gardam was controller of current affairs and documentaries. 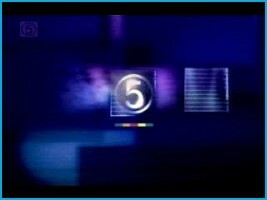 Before broadcasting could begin, Channel 5 had to retune video, cable and satellite equipment in over 9 million homes across the UK, to comply with the ITC Code of Practice on Equipment Retuning, which stated that they needed to retune 90% of homes affected before the service could start. This was to be the largest house-to-house operation since the conversion to natural gas. 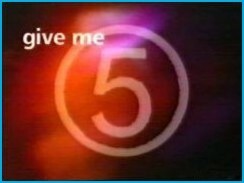 Channel 5 used the retuning programme to establish their identity and brand months before the channel came to TV screens with it's 'give me 5' campaign. In September 1996, the Department of Trade and Industry allocated Channel 35 for use by Channel 5 for an initial period of 5 years. Saatchi & Saatchi were appointed to help with the task of retuning around 3 million VCR's. Channel 5 had to visit ten million homes to check all households which could be affected. The retuning campaign cost £5million, with Saatchis responsible for through-the-line advertising. Wolff Olins created an image awareness campaign for the channel's re-tuning identity, under the banner 'Give me 5'. 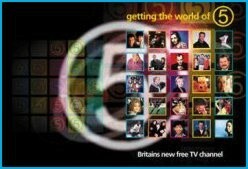 The Channel 5 image and brand were applied in poster and print advertising, re-tuning mailings, vehicles and staff clothing. For the re-tuning a video was also produced for the re-tuners to run while working, a promotional piece for use in Blockbuster Video stores and commercial sponsors. The retuning campaign achieved 92% unprompted awareness in under three months. The campaign was so successful that Channel 5 decided to use the same identity for its onscreen branding. On 26th September 1996, Channel 5 admitted it was not going to meet the deadline to launch on 1st January 1997, and that it may not be till March before the Channel launches. The delay was due to a need to retune an extra 1.8 million video recorders after the DTI made channel 35 available for use by Channel 5. On the 30th March 1997 at 6:00p.m. Channel 5 launched by the Spice Girls (when there were 5 members) and introduced by Tim Vine and Julia Bradbury. Overnight ratings showed that the opening night for the channel gained more viewers than Channel 4. 5 news revolutionised the way News was presented on television when Kirsty Young presenting from the newsroom perched on the front of the desk (instead of sat behind a desk as was usual). The channel also became the only terrestrial channel with a 'DOG', a small channel identifier in the top left hand corner of the screen. The intensity of the dog was eventually toned down after complaints from viewers. The first set of idents were 'live action' with the main colours used being the 5 colours of the 'five bar', Blue, Orange, Magenta, Yellow and Green. Some featured people, a spinning '5' logo, others mixed shots of things with the 'five' colours in, like pink rose petals. Channel 5 also were the first terrestrial channel to introduce film ratings. 'U' for Universal, 'G' for Guidance, 'C' for caution and 'A' for Adult. These would be shown after the ident. 1998 saw the channel gain more than 5% viewers for the first time since it's launch in 1997. Channel 5's controller of programmes, Dawn Airey, put the success down to documentaries, films, and a weekend of TV programmes which were themed around bad weather. It was also the year it was anounced it would be the end of the line for a large part of the cast of Family Affairs as Brian Park, the former Coronation Street executive producer. The entire Hart family, around which the soap was based are wiped out in an explosion on a boat at the wedding of the daughter of the family, Melanie (on January 29th 1999). After just two and a half years channel 5 revamped the channel with new idents. 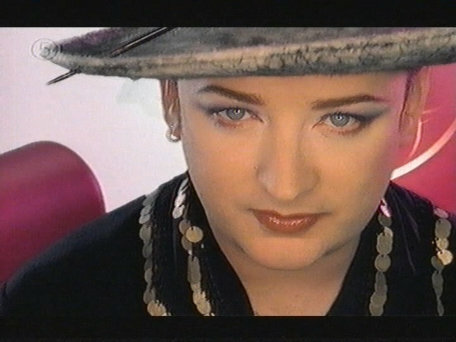 These second batch of idents, a very white set introduced in 1999, featured personalities including news presenters Kirsty Young and Rob Bultler, cook Kieth Floyd, DJ 'Dr Fox' and presenter Gloria Huniford who spoke via speech bubbles, with the exception of one featuring a naked Keith Chegwin. These were the first idents to feature the 'five bar'. The idents were supposed to "make fun of the channel'. In November 1999, Kirsty Young left 5 after a bidding war between Channel 5 and ITV. Kirsty went to co-present the ITV lunchtime news with John Suchet after agreeing to a two-year deal worth £500,000. In November 1999, Warburg Pincus decided to divest their shareholding and sold their investment to the remaining three investors. Channel 5 also launched a youth programming strand, with a new "post-apocalyptic teen soap" called The Tribe, together with existing shows such as The Pepsi Chart, Singled Out and The Mag. The strand was presented by Kate McIntyre. The on-air look for the strand, from The Design Clinic, included six new cartoon characters described as "a cross between South Park and the Mr Men" that will unexpectedly bounce around on McIntyre during the continuity breaks. Nick Wilson, Channel 5 programme controller for children's and religious programming said "Once you get past 13 the last thing you want is to be put into your own zone or slot." Hence the reason not to give the strand a name. In early 2000 Andrea Catherwood, from ITV News, joined the channel as the new face of 5news, replacing Kirsty Young. Her debut on 24th January saw a new 'white' look for 5 news. While the 'perching' newsreaders remain, the programmes now come from a set, sectioned off from the old newsroom setting. The new-look studio was designed to inject the station with a more "grown-up" and "subtle" feel. Chris Shaw, controller of news, said the revamped studio reflected the channel's commitment to presenting "clean" and "clear" news. Yet again the channel identity was refreshed after a year, introduced in 2000, the idents were similar in style to the previous set but this time the personalities were not necessarily presenters or personalities from the channel. The white now had a hint of one of the 'five bar' colours. In May 2000, the licence for the Channel 5 text was awarded to Teletext Ltd and is valid for 10 years from 1 July 2002. On 7 April 2000, Bertelsmann, GBL/Electrafina and Pearson announced that they had agreed to merge CLT-UFA and Pearson Television, both Five's shareholders, into Audiofina. After the approval of the merger by the European Commission on 30th June 2000 and the admission by the UK listing authority, the new group was renamed RTL Group. United News and Media plc also changed it's name to United Business Media plc. The shareholding of Channel 5 was then: RTL Group 64.625%, United Business Media plc 35.375%. The 'personality' versions of the idents were discontinued in mid-2001 and a set of edited short versions with animated darker backgrounds were introduced in September 2001. In October 2001, Channel 5 announced the return of Kirsty Young to the channel. She has accepted a £500,000-a-year deal to leave ITV and rejoin the Channels news team after two years away. This come shortly after she anchored five hours of running news after the attack on the World Trade Centre on September 11th. While at ITV she had also presented a science show, How Do They Do That?, a quiz show, The People Versus, and she presented a pilot of the crime show Rat Trap. On July 16th, Home and Away finally launched on the Channel after a year away from British TV screens. A new identity to "refresh" the channel was announced in early 2002 and on Monday 4th March 2002 a new ident, supposed to give the channel a "sophisticated" look, was launched. Almost immediately after, it was announced that Channel 5 were to relaunch in September of that year. Shortly before the relaunch Channel 5 were awarded the first ever "Channel of the Year award 2002" at the Edinburgh Television festival. The new 'five' was developed by creative strategists WalkerBannisterBuss; design agency Spin and advertising company TBWA\London WalkerBannisterBuss worked closely with Five's creative strategy team in Programming and Marketing to help identify and articulate the channel's positioning moving forward. WBB helped to distil key themes from existing and new research, and to formulate potential positioning for the channel, before working with the team to identify the channel's core values and organising thought. The Spin team of Creative Director, Warren Beeby, Group Account Director Martin Saunders and Senior Designer, Chris Turner, worked with Five's in-house Creative Services department to create an entirely fresh on-air look comprising an integrated graphics system and a new logo, plus personality-defining live-action idents. The channel's logo, previously the number 5 within a circle supported by the colour bar, will now be replaced by Five, which will always appear in lower case. The original 'five bar' colours have now been expanded to five distinct palettes, each comprising five colours. The channel will also use "purely typographical promos - which will see copy-written type overlaid over sound bites from the channel's key shows". The new look, launched on 16th September, also saw the disappearance of the 'DOG', as according to 'five' it was no longer needed. At the end of 2002, Five secured new transmission frequencies to broadcast to the 50 per cent of homes in the affluent South East that its patchy coverage has missed. The company was given clearance to use four transmission masts in the region, with a further four are understood to be close to agreement, bringing Five into a further 1.1m South East homes out of a total of 2.2m households. Five signed up to a new 10-year licence with the Independent Television Commission on 13th March 2003.Instead of the annual cash sum of £24.6m which Five paid under the old deal, it will now pay around £4.4m a year, but under the new licence, which takes effect from, Five will also pay 8% of "qualifying revenue", made up mainly of sponsorship and advertising. This was meant to make the licence more responsive to the vicissitudes of the advertising market. Early in 2004, five anounced that as of January 2005, the news provider for the channel would no longer be ITN, instead the news for fives bulitins would now come from Sky News. This is the first time that any of the terrestrial channels have chosen anybody other that ITN to provide the main news for the channel, although Channel 5 have been broadcasting Sky News' 'Sunrise' in the mornings for a few years. In July 2005 RTL bought the UBM shareholding to assume full control of Five.